Amazon UPI Offer – Hello guys, Now a days we are surrounded buy number of UPI offers, why not UPI transactions are easy and secure too. Paytm, mobikeik, phonepe, freecharge always comes with upi cashabck offer, Where they offers 10% to 100% cashback on UPI Payment/Transaction. 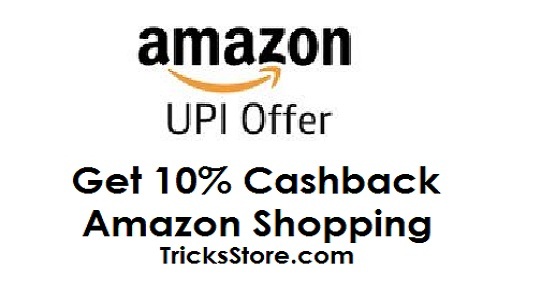 But Now Amazon joins the race and giving Amazon UPI Cashback of 10% upto Rs 100. Amazon UPI – As Like our old Freecharge UPI Offer, Paytm UPI Offer & Phonepe UPI Offer Amazon is also Launched it’s UPI Offer because UPI Payment is common among us. So in this amazon UPI Offer, Amazon is Giving 10% Cashback up to Rs.100 when you make transaction with amazon UPI on Amazon shopping/transaction. This offer is simple as you are thinking just select the amazon UPI for payments and get amazon pay cashback. So guys hurry up cause Offer will Last until 21st June 2018. 2. Now make Log in/Sign up on Amazon. 3. Relax and Choose Product you wanna buy. 4. After that add all the products to your cart. 5. Now proceed to Payment Page. 6. Here just pay amount with UPI Payment Method. That’s it guys, You are eligible for this for by doing this. 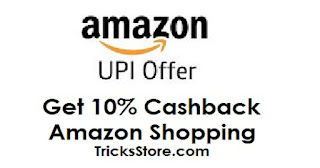 You will get 10% cashback on total shopping amount with Amazon UPI Offer. * Cashback of 10% up to Rs.100, once per user in the offer duration. * Offer duration till 21st June 2018. * Within 10 days of completion of purchase transaction you will get Cashback.